This easy and elegant recipe for Dijon shrimp scampi is perfect for both dinner parties and weeknight suppers, and can be ready in about 15 minutes! I have been making this elegant and easy little recipe for Dijon shrimp scampi ever since the Southern husband and I got married, so we are literally talking decades now. It’s great for weekday dinners when you want to make something quick and tasty, but it is also perfect for a little (or big) dinner party, because it has a lovely little sauce that looks and tastes very ooh-la-la. And I’m here to tell you that ooh-la-la is just as important when it’s just you and your decades-long honey as it is when you are throwing a dinner party. So with that in mind, let’s make it!Because it has just a few ingredients, it’s important that all of them be fresh and lovely. So here’s my suggestion for how to go about that. Shrimp: This is actually true for whatever you make with shrimp…you want to make sure they are fresh and as much as you can, sustainably caught. Here’s a great post from Serious Eats that tells you everything you want to know about shrimp. Lemon juice, garlic, parsley: all fresh please. Trust me, you will taste the difference – there’s nothing like fresh ingredients. Mustard: Do use the Dijon variety if you possibly can. It’s got a little bit of white wine in it and that makes a nice impact in this recipe. Butter: Use the good stuff. If you don’t make your own (yes, I just said that. It’s RIDICULOUSLY easy) I like Kerrygold and Kate’s Homemade Butter (that is an actual brand, I don’t own a churn. Well actually, I DO own a churn, but it is purely decorative.) You can buy it at Whole Foods and Fairway. Once the shrimp is done (which is going to be about 10 minutes after you start it), the only thing left to do is decide what you are going to serve it with. I’ve served it over rice, pasta, farro, polenta and when I am feeling especially virtuous, steamed asparagus. All are scrumptious. So without further ado, here is one of the nicest, easiest, hardest-working recipes in my collection! Melt butter with garlic in large skillet. Saute shrimp over medium-high heat until just cooked through, about 3-5 minutes. Whisk in mustard, lemon juice and parsley and heat through. 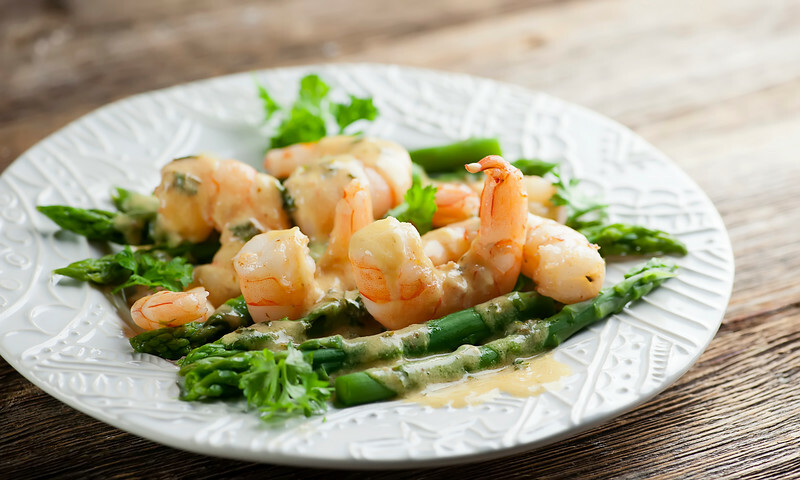 Serve shrimp with mustard sauce drizzled on top. Hi! I'm relatively new to your blog and am truly enjoying it. I tried this recipe over the weekend for guests and it was as delicious as it is easy! I've passed the recipe (and your blog link) along to several foodie friends. I did make one lovely modification – out of desperation. (Isn't that the way new successes usually happen in the kitchen?) I ran short of Dijon mustard, so I substituted half of the measure with Maille Old Style Whole Grain Dijon. The whole grain mustard added texture while the Grey Poupon maintained just enough creaminess. Hi there — yes, I totally agree about last minute substitutions leading to great surprises! That sounds delicious, I am going to try it that way next time! I could eat asparagus for every meal, I think. Especially with SHRIMP! Thanks for all your sweet words (as usual) – hope you are having the best weekend! PASS SOME OF THIS my way!! PUHH LEEEEZE?! You know it – I always make enough to share!! I love a great go-to like this that works great for a lovely weeknight meal or impressive dinner party dish! And I’m always in the mood for shrimp, so this will be on our menu soon! Pinned! Thanks for the pin, Kathryn – hope you love it! The shrimps look amazing, my only worry is that 1 pound of shrimps would be just enough for my husband and me. :) And I love Kerrygold too, my favorite butter. Ha! With you on being able to eat Lots Of Shrimp! You always have the best-looking seafood dishes. You’re making me so hungry! I love dijon mustard and your scampi dish sounds terrific. Scampi is a favorite at our house Kate! My son Sean would eat it for every meal if he could! Yours looks delicious! Scampi for breakfast – I love it! Kate, you kill me with your shrimp dishes. 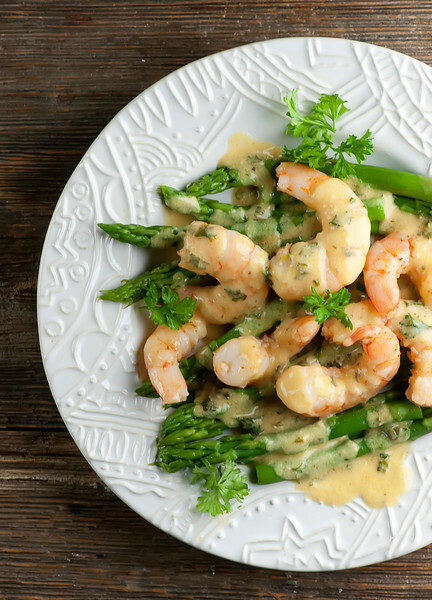 My kids have been begging for shrimp and I know just what I’m going to make – over rice for the kids and “virtuously” over asparagus for my husband and myself. Thank you for this recipe. Oh, if only my daughter liked shrimp – she did not inherit my shrimp crush. But more for me, right?